I rendered this animation last night of one of my favorite floraform pieces we’ve generated so far. It exhibits an odd, spiraling, 5-form symmetry as it grows. 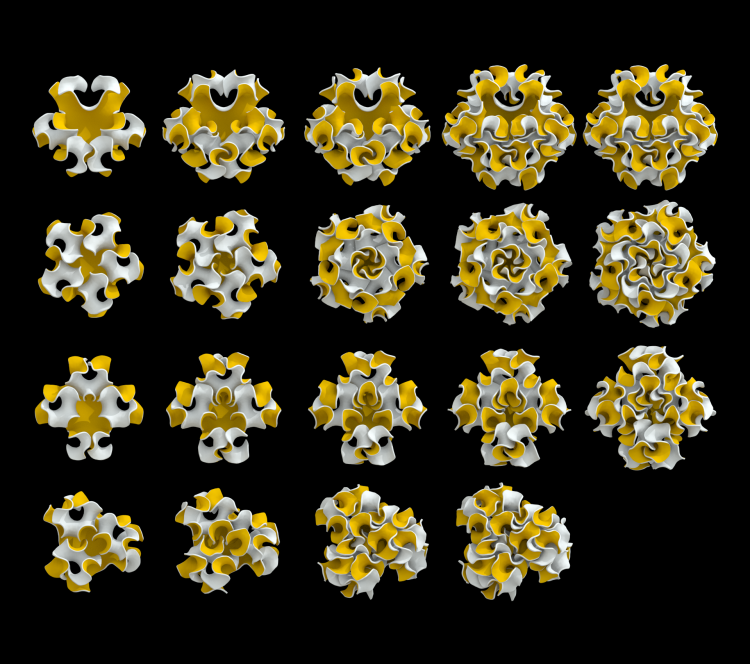 This radial symmetry is not present when the same piece is generated with 3, 4 or 6 growing zones. Our floraform system is an on going project that explores differential growth of surfaces and was inspired by research into the development of leaves and flowers. It is a thin shell simulation that models surfaces growing at variable rates. Complex, ruffled forms emerge from simple initial surfaces as they grow preferentially along their edges. This reminds me of coral growth as well. The impression is that of subsections “respecting” the presence of other sections while still answering to their own growth imperatives. Horrible anthropomorphism, I know. I did say “impression”. I’m wondering if this can’t be rendered more rectilinearly, and be an inspiration for architectural growth like fractal designs with which we are all familiar. Questions: can the growth be more random, yet still exhibit this “respect”; can it do this while at the same time respond to some environmental preconditions, like a terrain?